A Web Browser to setup your account. You need a valid account and some understanding of how the platform works before diving in the application. We are working to keep the AudioBox experience within the walls of the app, but until then the account setup must be done through your Dashboard. If you are not sure why a specific feature does not work, just drop us a line, see the Contact Us page, and we'll be happy to help. In order to sync and stream from remote cloud services, such as SkyDrive, Dropbox, etc. you need a valid subscription. You can choose any paid plan, starting at $.99/mo. To perform this operation just go into your Dashboard and subscribe. If your media file contains correct metadata, tapping on the artwork on the player screen will make lyrics appear. Playlists needs to be refresh manually when adding/removing media files on the platform. From the track list view pull down the screen to refresh them. Trouble with large media files from AudioBox Desktop. Sometimes the iOS app might face some problems while streaming large media files, especially from AudioBox Desktop. There are a number of technical factors for this, for example if you have a 2 minutes/40MB track, remember that you are on a mobile device and things should be tidy. Even if you are in WiFi mode you can't really expect that a phone can keep up this kind of streaming, especially if your upload speed is poor. If the app sees no incoming data it will attempt to switch to the next track to continue the playback. The streaming engine is provided by Apple so it stricly follows their rules. 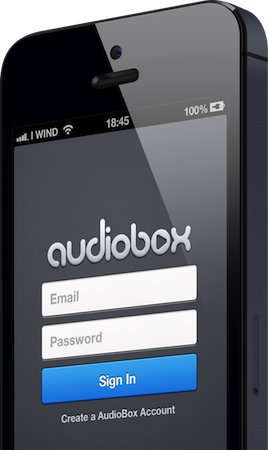 For best results in almost every situation we recommend using the always available AudioBox Cloud to store your files. Usually a 256kbps MP3 file will do the trick nicely. Error: AudioMash is missing, subscription not valid or required software not running. You may get this error because the setup of the playlist you are trying to stream is not complete yet. If you are streaming from external storage services a subscription is required, get one. If you are subscribed user and the error message appears, fix your account by connecting to the requested service. If the error appears on the AudioBox Desktop playlist make sure it is running on your machine. It means attempting to mix the output audio with the one from other application, such as games. This setting is not recommended because weird things may happen and you will lose the deep audio integration with the device, lock screen artwork support and remote controls. Especially useful if you use offline media files, this setting will stop downloading data when you are on Cellular network. It's still in beta and we are gathering feedback. It's a frontend to an already bootstrapped AudioBox account. Do not downrate the app because you do not understand how the platform works. App has nothing to do with this. If you are having problems getting something to work, just ping us and we'll be happy to help!